Named one of the best races in the country (thanks, USA Today! ), Richmonds biggest block party is the place to be on April 13th. With 25,000 participants, youre bound to be entertained whether its by costumed runners, Spirit Groups, live music, or the beautiful, flat course. Throw in a race for the Virginia529 Kids Run and the rockin SUBWAY post-race party, and youve got yourself one of the best social events of the year! Post-Race Food & beverages– for participants ONLY, please! Plan to meet up with your crew under the sign corresponding to the first letter of your last name. There is no packet pick up available on Race Day. A photo ID is required to pick up your race packet. You may pick up a race packet for another pre-registered runner, provided you have a copy of their photo ID. Run, walk or ride your bike. Bike Valet is available in front of the Altria Theater, across from Monroe Park. AVOID THE BELVIDERE EXITS off I-95 and I-195. ALL MOTORISTS SHOULD USE I-95 & I-195 AROUND THE CITY. Free parking is available on streets throughout the area. Park EAST of Belvidere to find on-street and surface-lot parking. Take advantage of a Race Day Shuttle (ticket required). Arrive early, as these spaces fill quickly, or beat the crowds and pre-purchase your parking spot for $8. The price will go up to $10 on event day. Be sure to follow the given directions to avoid street closures. Parking spaces are limited at both locations so carpooling is recommended. A wristband on the shuttle bus does not guarantee you a parking spot in the parking lots at either The Diamond or City Stadium. On-street parking is also available at each location. Shuttles will run on a continuous loop between 6:30 a.m. and 1:30 p.m. from each location to the drop off point. To ensure that you have enough time to walk from the drop off point to the start line, please plan to arrive at your shuttle pick up location at least 90 minutes before your wave is scheduled to start. The drop off location is 8 blocks from the 10k start area where waves begin to line up. Each shuttle passenger must have a wristband to board the shuttle at the pick-up locations. This race is sanctioned by, and conducted under the rules of, USA Track & Field. In consideration of the safety of all participants, NO HAND CYCLES, BICYCLES, STROLLERS, BABY JOGGERS, BABIES IN CARRIERS/BACKPACKS, ANIMALS ON LEASHES, SKATEBOARDS or SKATES will be allowed on the course. This will be strictly enforced. Event registrants grant permission to the Sports Backers to use any photographs, motion pictures, recordings, or any other record of this event for any legitimate purpose. No one other than registered race participants may cross the finish line. Please do not have anyone join you for the final stretch. This is strictly enforced. 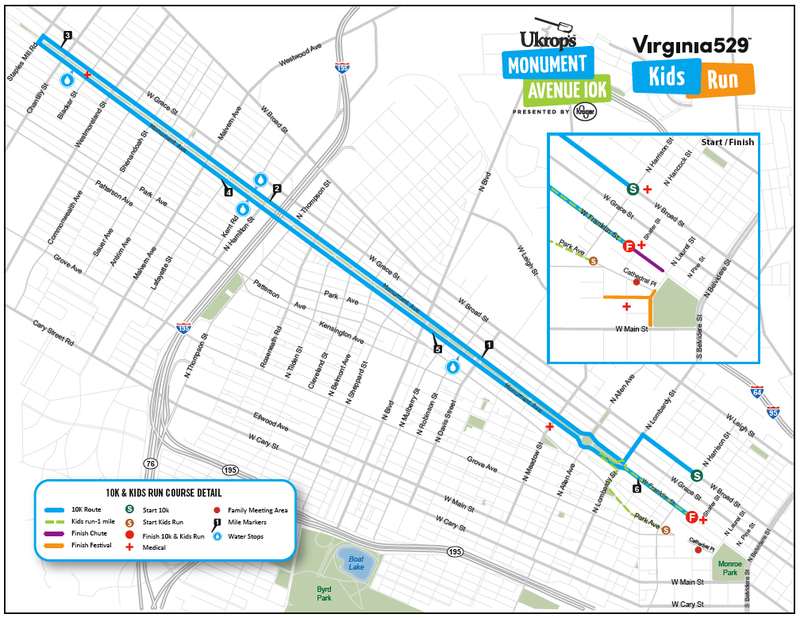 How was Ukrop’s Monument Avenue 10k?